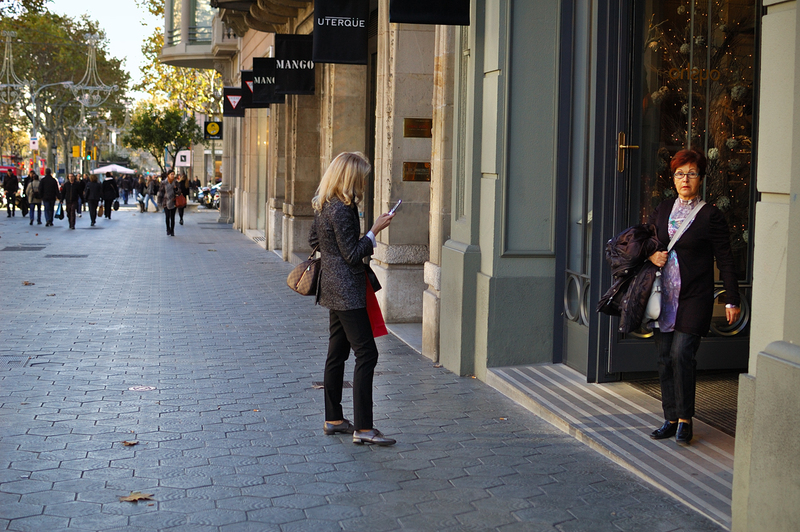 Shopping in the most expensive street in Spain is risky for the wallet and yet there are some stores along Passeig de Gracia, Barcelona where you can adventure into compulsively squandering your monthly salary. While on a shopping spree though, it is easy to pull out the plastic magic wand usually known as Visa and also referred to by many other names with unpredictable effects. At that moment, you are the luckiest person in the world, you have overcome centuries of cash exchange to finally manage to get goods for free. But fairy tales are illusive and the fantasy created by the wand gently fades away by the end of the month. You wake up naked wearing a fig leaf, fleeing from a bunch of goons in black sent after you to gently remind you that your magic wand has been cancelled and you owe money to the bank. The lady in your photo who looks as if she owns the world! May be she just swiped her wand and got her wishes fulfilled:) Perfect comparison and great shot!